This has been a very perplexing NFL season. The Giants are 0-6, The Steelers are 1-4, the Redskins are 1-4, and the Buccaneers are 0-5. Eli Manning is the worst QB in New York, and Matt Schaub isn’t even the best QB on the Texans roster. Patrick Peterson has played seven positions this year, while Rob Gronkowski has played zero. Philip Rivers is the 2nd best QB in the league, and Jimmy Graham, a tight end, is the best receiver. Bilal Powell is better than CJ Spiller, and Donald Brown has outran Trent Richardson in the latter’s young tenure with the Colts. Rex Ryan’s seat is cooler than that of Mike Smith and Tom Coughlin. What has gotten into the NFL? The players, coaches, and teams that we’ve grown to love watching succeed, have been failing. 2. Marques Colston- Colston has always been the favorite receiver of Drew Brees. Even in the hey-days of Lance Moore and Devery Henderson, Colston got the bulk of the targets. With Kenny Stills’ emergence, and the continued growth of Jimmy Graham, don’t expect to see big numbers from Colston anymore. By the end of the season, the Hofstra-grad may even be the 3rd or 4th option for the team. 3. Mark Ingram- the former 1st round pick and Heisman winner has, in most aspects, already lost his job. Pierre Thomas and Darren Sproles have always gotten the bulk of the carries, but at this point, Ingram is a non-factor. He’s only been active two games this season, and in those two games he had a combined 31 yards. Khiry Robinson, a downhill runner, who runs a very similar style to that of Ingram, may now be the Saints goal-line, change of pace back. He has 137 yards and a touchdown thus far this season. 4. Matt Schaub- last season, Schaub had 4,008 yards, 22 touchdowns, and 12 interceptions. Pretty solid stats… So far this season, well, he’s been a trainwreck. He threw a pick-six in 4 consecutive games. He’s only amounted 1,552 yards, 8 touchdowns, and 9 interceptions so far. He’s already been pulled in favor of TJ Yates twice, once due to performance and the other to injury. Even if Schaub’s injury isn’t major, I still dont expect for him to be the starter at the end of the season. When Schaub and Matt Leinart both got injured at the end of the 2011 campaign, TJ Yates started, and he actually led them to the second round of the playoffs, after defeating the Bengals 31-10. They also have Case Keenum, arguably the best college QB of the last five years, on their bench. In 2011, he threw for 5,631 yards, 48 touchdowns, and just 5 interceptions with the Houston Cougars. Keenum is the NCAA all-time passing leader. With Keenum and Yates pushing at his job, plus his constant string of injuries, I don’t see Matt Schaub as the Texans starter by the end of the season. 5. Christian Ponder- behind him, he has two very capable QBs in Josh Freeman and Matt Cassel. If not for the “conspiracy” that unfolded against Freeman in Tampa, he’d still be the Bucs’ starter, and Ponder would have more job security. But that’s not the case. The Vikings have stockpiled mediocre QBs, with Ponder, Cassel, Freeman, and even Joe Webb. A team with Adrian Peterson, Greg Jennings, Kyle Rudolph, and Jared Allen shouldn’t be 1-4 to start the season. But they are… And this failure largely rests on the shoulders of Ponder. I’d be shocked if he’s starting for Minnesota into late November. 6. Ron Rivera- on paper, the Carolina Panthers’ team isn’t all that bad. They have the great Cam Newton under center, with Steve Smith and Brandon LaFell at WR. In the backfield, there’s DeAngelo Williams and Mike Tolbert. And let’s not forget Greg Olsen, one of the best tight ends in the league. The O-Line is average, led by Ryan Kalil and Jordan Gross. They also have a very capable defensive unit with Luke Kuechly, Star Lotulelei, Captain Munnerlyn, and Mike Mitchell. So, why are they 2-3? Well, the main reason, I believe, is Rivera. He’s lost the clubhouse and the fanbase, and his style of play not only doesn’t suit the team, but isn’t very hard for the opposing teams to solve. 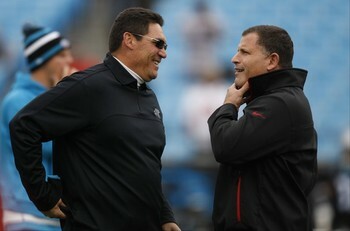 With all the adversity that he’s facing, it’s highly unlikely that Rivera retains his job as the Panthers’ head coach. Schiano for sure. He has dismantled a potentially average team. It is now a bottom feeder. Yeah. Schiano has had a disaster filled tenure with the Bucs. 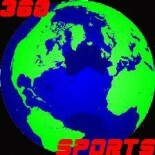 Check out our next podcast for our conversation about the Bucs mess. This entry was posted on October 14, 2013 by smarkowitz1 in Analysis, NFL.